If you've been holding out on gardening because you “don’t have a green thumb,” you had better think of a better excuse. 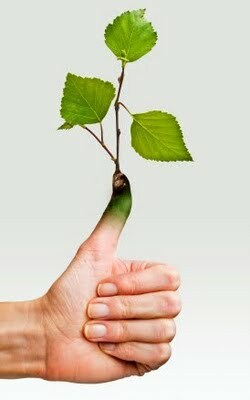 The green thumb phenomenon is the seemingly natural gift of tending to, caring for, and growing plants. Contrary to popular belief, no person is born with an inept ability to grow plants; this talent is developed just like any other skill, through knowledge and practice. If you want to appear to have the gift of a green thumb, you need only to practice the art of gardening. Follow these tips to develop a green thumb of your own. Steady Interest – If you've never done any serious gardening but want to develop a green thumb, get interested and stay interested. This is where most new gardeners have the most trouble, and here is why: you wake up one beautiful sunny morning and impulsively decide to plant your very own garden. You go to the store and buy a plethora of seeds, some good top soil, pots, fertilizer, and a matching watering can and mister. You plant your seeds and set them on the windowsill where sprouts will get plenty of sunlight. Now, this is where it goes downhill. The first couple of days are exciting, but you quickly lose interest. Next thing you know, you’re staring down at a dried up pot of cracked soil barely fit for tumbleweeds. The first step in growing healthy plants is remaining interested. Stay involved and your plants stay healthy. Awareness – Another big step in developing your green thumb is becoming aware of how your plants respond to your care. If you over-water your plants, you’ll notice a soft stem, lack of growth, and yellowing of leaves. If you under-water, you’ll notice extreme wilting. It’s important to be aware of how your plants respond to your care, so that you can alter your methods when plants seem to be struggling. Experiment with your sprinkler system habits to find the best irrigation pattern for your plants. Knowledge – Passion and observation won’t do you any good if you don’t know the basics. Make sure you spend ample amounts of time researching plant species in order to adequately care for each one. Reading gardening blogs and looking for tips from seasoned gardeners will help you further you knowledge and skill. Remember, you should never stop learning. As long as you keep a knowledge-seeking attitude, you’ll do just fine. Plus, when you become skilled enough, you’ll be able to give back to your online gardening community and help other new-gardeners develop their green thumbs, as well.